The Bible is a collection of texts. These texts are usually called books. There are different versions of the Bible. These differences come from the fact that certain religious communities include those parts they find important and leave out other parts they think are less important. 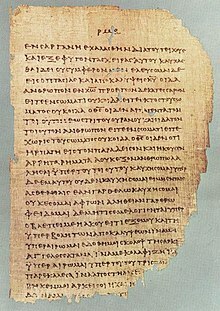 A Biblical canon is a set of books of the Bible that a certain movement considers Scripture (that is, inspired by God). These books are in almost all Christian Bibles. Some Bibles contain other books as well. These books were written before the birth of Jesus Christ. These books were written after the birth of Jesus Christ. This page was last changed on 2 January 2015, at 00:44.